Eat, Drink, and Sleep the Martial Arts!! There is a problem with your level of martial art skills! What could happen if you join the martial arts adventure now? Is this a real martial art system? Yes, there still is a real complete martial art system with traditional values and modern training that can provide you the fulfillment you’ve always dreamed about with martial art system. Can I learn the basics in such a short amount of time? 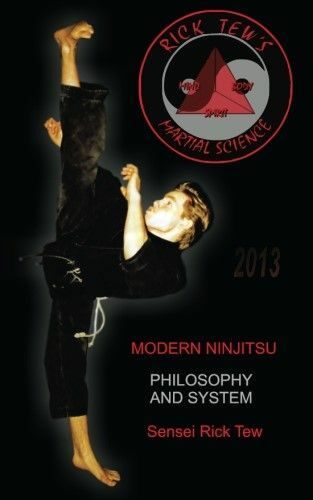 RTMS which is Rick Tew’s Martial Science is founded on the philosophy of Ninjutsu. REALITY: It is unrealistic to believe that all martial arts are the same. Students who join us now are able to get the great training that was available more than a decade ago along with the wisdom from the many adventures that the system has participated in. In many ways, you will take this voyage too and be able to gain insight into who you would like to be. We are a multi-martial art system. This means that we do pretty much everything related to the martial arts. Note that I said we are a system. No we are not just combining Muay Thai, Fitness, MMA and calling it a martial art camp. Sadly that is the cookie cutter strategy by most businesses involved in the arena. Instead, we offer a traditional martial art system from the ground up with 5 ranking levels that include modern and realistic strategies. Yes, the system also includes full contact mma as it has since we started it for more than 20 year. Grappling has been a part of the system since the beginning too and Rick was very adamant about having grappling as a part of his program as he was a wrestler in high-school and knew the value of ground combat. Rick also was an avid kick-boxer and made sure that realistic training has always been an option for Students. What you really get with our system is organized variety. It is a system that can help everyone but it is tailored to the individual. This means that we build the system around you so that you can focus on developing your own strengths and eliminating weaknesses. Not everyone wants to do full contact to the head or do repetitive strikes that lead to future damage. Since Rick has been in the martial arts for so long he also knows what could be damaging. With so many copy cats online, how do I know who is legit? Our Martial Arts training is like no other program or system. However, Mr. Tew will not be around forever and we all know what happens when we make a copy, of a copy. So you can get the rare tradition and system under its founder right now. We are a multi-martial art that uses the outdoors, great people and the overall experience to create a training program that meets all of your martial needs. 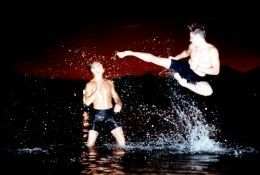 Everyone could use some routine martial arts training to help them stay fit, break old habits, improve their self-confidence and self-esteem. Most systems are limited to a few punches and kicks and Students either get bored or lured into a zombie like state of repetitious movements. We are all about variety and though you may only be interested in a few martial skills, we have the ability to take you all the way to earning a REAL BLACK BELT if that is your goal. I don’t like military type martial arts training but still want a solid structure and system. One of the many great things about our martial arts training is that it is fun. We conduct training and classes in a way that feels natural and though structured it has enough variety so every day is unique. No two days are the same and we realize that no two people are the same either. This is why we also have a system that builds around YOU. Most martial arts expect you to conform or mold to fit its rigid form. This is great for the system but it does very little to help you develop your true potential.